We are a UKAS/IDEST accredited cylinder test centre. We offer pressure testing and refilling for liferaft cylinders, as well as breathing apparatus, diving cylinders, fire systems and storage banks. Liferaft cylinders are weighed and checked. If out-of-date, we will carry out a hydrostatic test in-house. 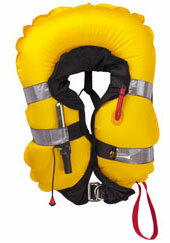 Lifejacket cylinders can go rusty for a number of reasons. They will be checked and replaced if required.